Robin Booth led out the two title-winning show pens for the family, who also secured back-to-back championship and reserve championship successes at the corresponding fixtures in 2013 and 2014. The NEMSA showcase remains one of the leading fixtures of its kind in the North of England and the first major Mule lamb sale of the year. Robin Booth is pictured left with his champion pen of ten Skipton NEMSA gimmer lambs, joined by, from left, Chris Pearson, of Pearson Farm Supplies, judges John Gate and John Greenhalgh, and Armstrong Watson’s Jonathan York. Half of the champion pen of ten was by the family’s renowned Bluefaced Leicester ram, D15 Smearsett, a former Kilnsey Show supreme champion, who has been used to good effect by the Booths for the past five years. He was also responsible for some of their previous victors. The latest title winners sold for the day’s leading price of £280 per head, up £30 on the previous year, to Ross Sizmur, of Okehampton in Devon, while the Booth’s first prize pen of 20s, which had similar breeding, also achieved top price in their section when selling for £180 each to the same buyer. Mr Sizmur, who was making his first-ever visit to Skipton, is a North of England Mule aficionado, keeping up to 1,500 ewe lambs at any one time and selling them on at every stage of their development. He said the breed was ideally suited to his rich and fertile lowland pastures. A solid turnout of 7,357 Mules sold at an overall average of £96.84 per head, up £6.35 on 2015. The quality of the pre-sale show was particularly impressive, with 21 pens of ten and 12 pens of 20 presented for judging. Former Skipton branch chairman Kevin Wilson, of Blubberhouses, who headed last year’s prices, was second top this year when his second prize pen of tens sold for £205 per head to Leicestershire buyer, Ken Gill, of Burton Lazars. They were by a selection of home-bred tups, along with others from Alan Busby’s Harland flock. Mr Wilson was also responsible for the fourth prize pen of 20s, which made £142 each. Multiple past champions Ashley and Rachael Caton, of Otterburn, were again among the front runners with the second prize pen of 20s, which made £135 each, and the fifth prize tens pen, sold for £170 per head. The same price was achieved by fourth prize pen from the Fawcett family in Drebley, who also stepped up with the fifth prize £138 per head 20s. Charles and Richard Kitching, of Threshfield, also sold a pen at £195, closely followed by a £190 pen from Ellis Bros, of Addingham Moorside. 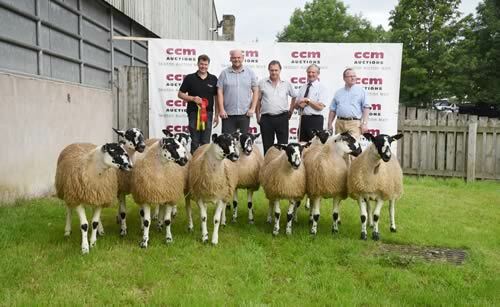 CCM Auctions again presented cash prizes for the day’s leading flock averages. Of the vendors consigning 100 or more lambs, it was the Booth family who again led the way when their 137-strong consignment averaged £137.81 per head, with James and Janet Huck, of Austwick, second top with 125 lambs at £120.52. The Fawcett family - husband and wife Stephen and Tracey Fawcett, and their daughter Samantha - led the flock averages for under 100 lambs, with their 72 charges levelling at £121.75 per head, followed by Calton’s Robert Crisp with 64 at £107.16 each. Title winners in both show classes received Ciba Geigy perpetual trophies, with the champion pen of tens, judged by John Greenhalgh, of Bashall Eaves, and John Gate, from Northwich, also awarded the Chester Kneller Memorial Trophy. Co-judges in the 20s class were David Calvert, of West Marton, and Airton’s Alan Thwaite.